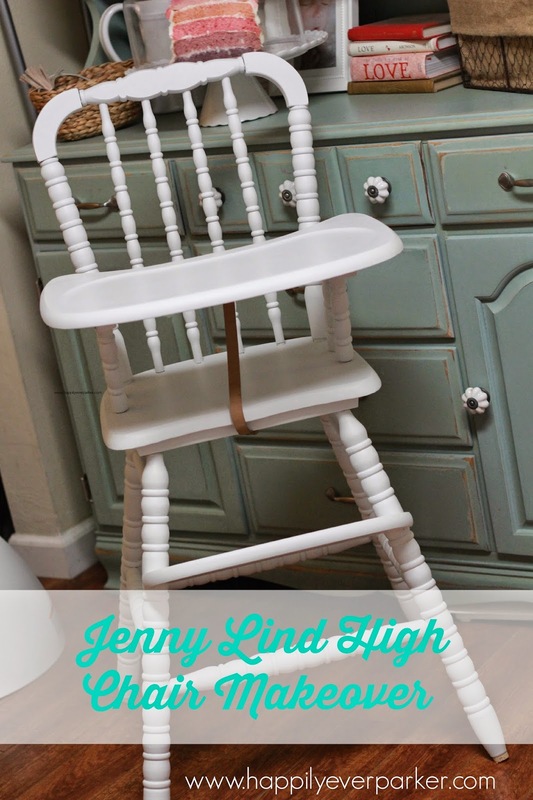 Last year I was able to find an original highly coveted Jenny Lind high chair from the 80s. After seven months of searching I was so excited to find one a town over from where I live. Especially because the guy just had no clue as to why a woman was offering him $50 for it after I had already claimed it (for $25). Alas it had sat dusty in my garage waiting to be loved ever since that day I bought it super pregnant. Since Presley will be starting on solids when she hits the 6 months mark (tomorrow!). It was due time to get my husband started on this project. I tried to take photos of the process to share but feel free to ask any questions if I missed a step! Here is the original in all her dusty glory. First David removed all the hardware. We thought about changing it to make it easier to pop the tray off. However I felt if there ever comes a day if we want to sell it I wanted it all original. So we kept everything the same. 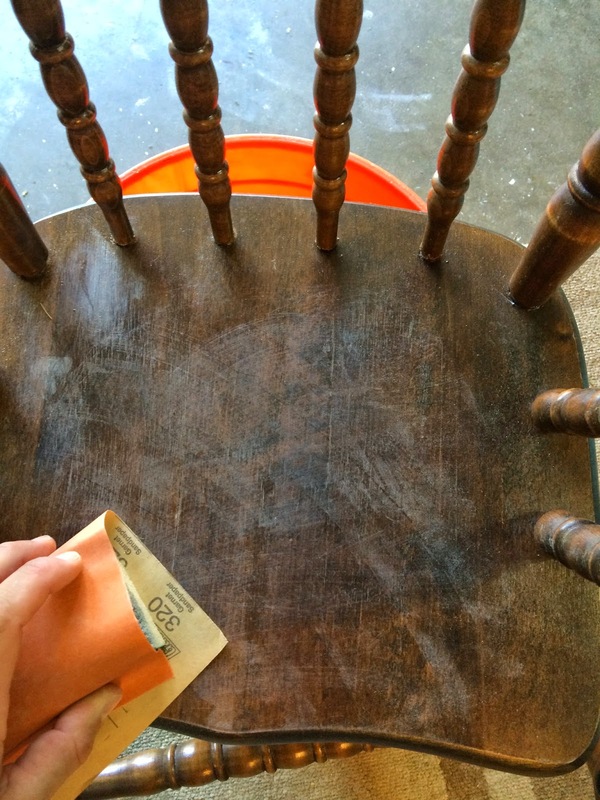 Next step was to wipe the highchair down with water to remove dust and dirt. After the initial bath David than lightly sanded any slight imperfections. He used 320 grit sandpaper. 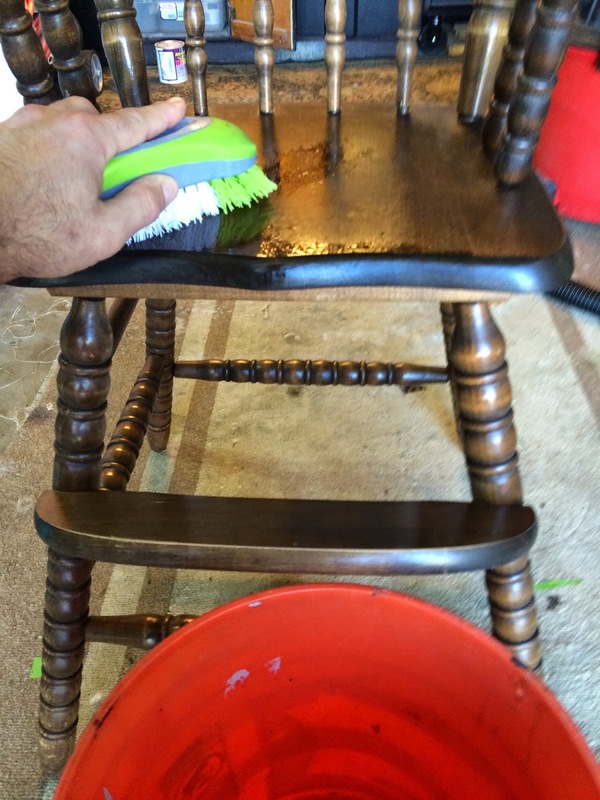 After the chair was sanded he washed it again with water and used TSP to give it an extra good cleaning. 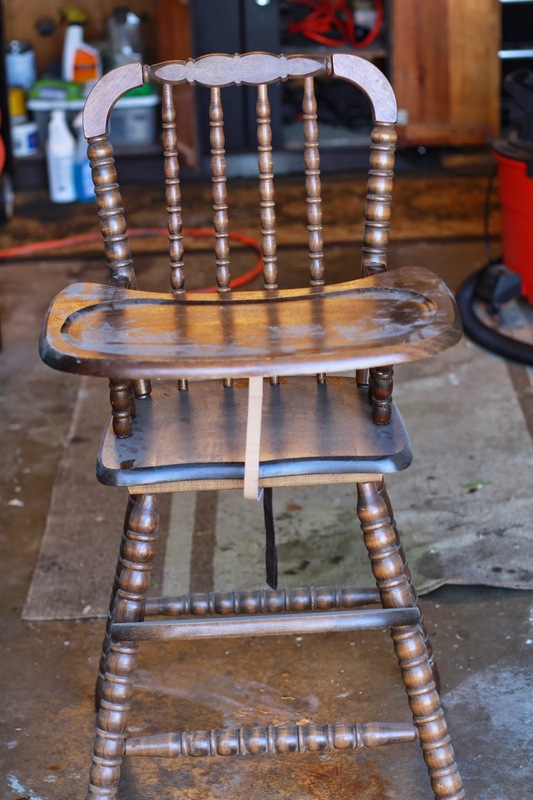 Once this was complete he allowed the highchair to dry overnight in a well ventilated area. 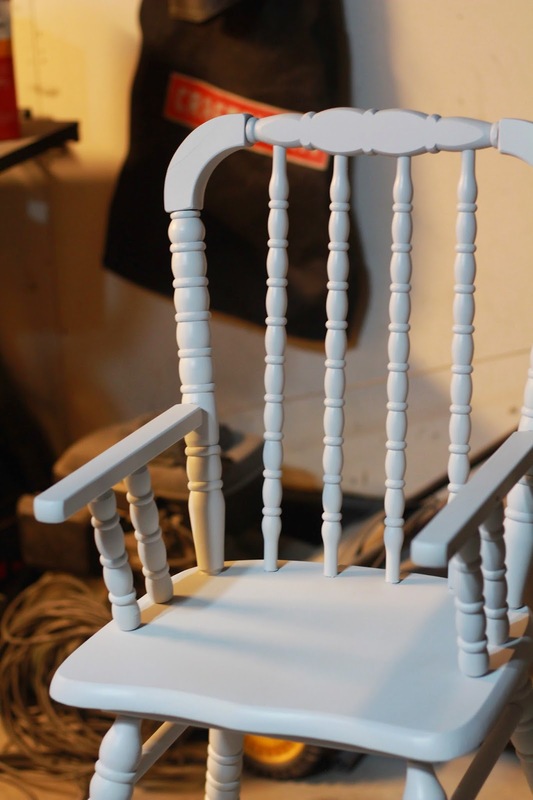 Once the chair had completely dried he disassembled it to make the painting process easier and more through. He then used painters tape where the wood connected so he could wood glue it back together in addition to the screws. 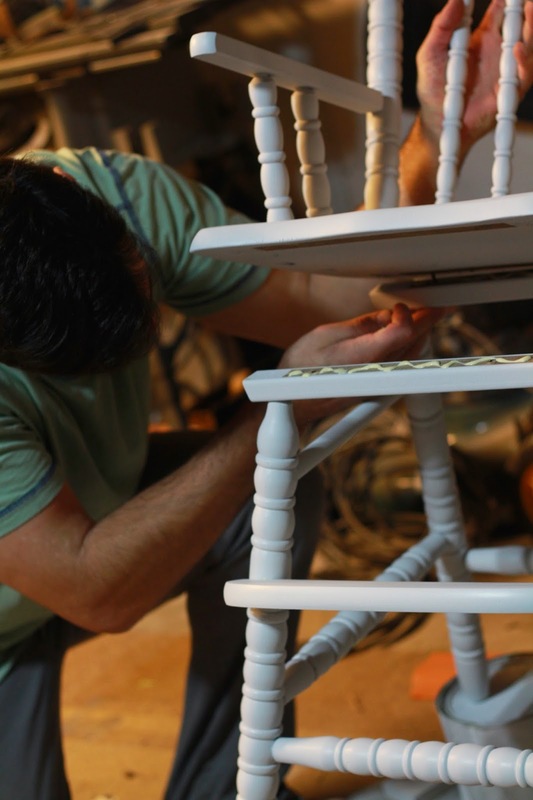 David uses an air compressor to paint most of our furniture. His technique is so awesome you would swear all our pieces are store bought. 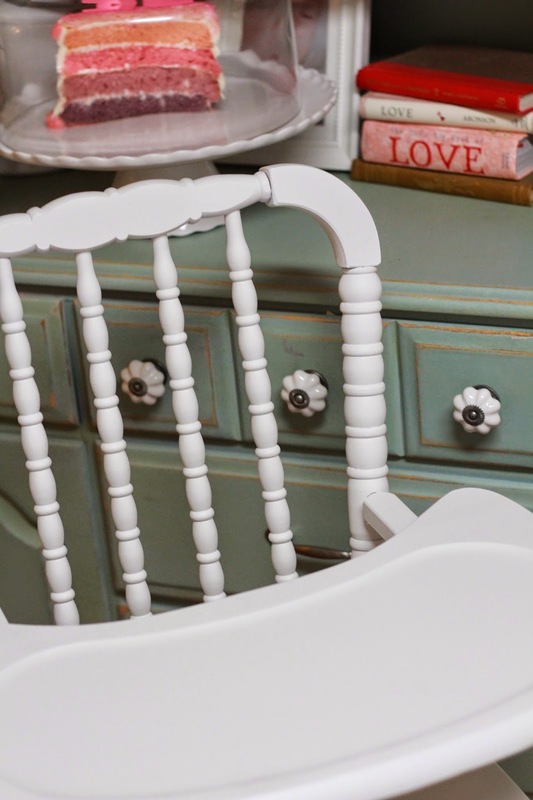 For the project it was important to me to use a no VOC paint since Presley would be eating directly off the tray. For this project we used Valspar Optimus Interior Paint. 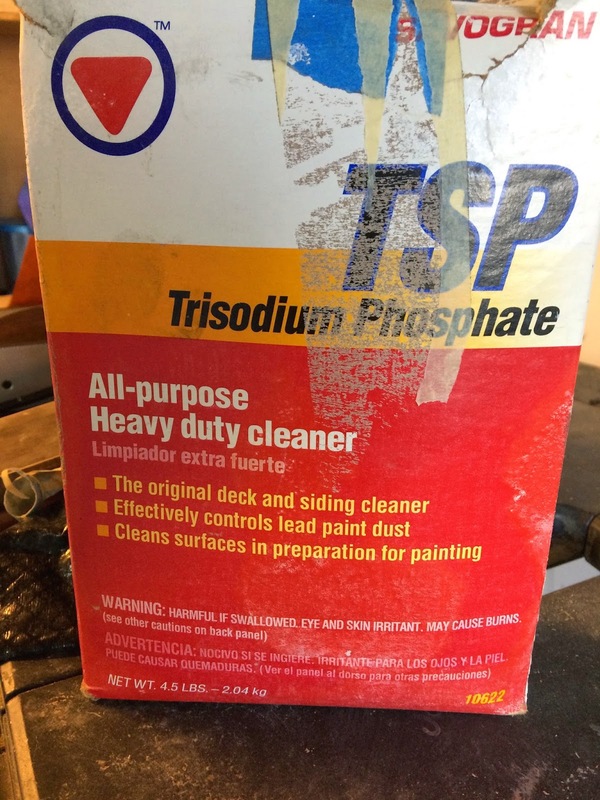 This is a low-odor, no VOC paint. We will be applying some sort of seal or wax to the paint to prevent staining but this stage hasn't been completed yet. After David had finished painting it was now time to remove the painters tape and reassemble. Notice in the above photo there is tape painted over. This is where the foot board goes. He marked the spots to adhere wood glue and screw it back on. Once he removed the tape he placed wood glue on the foot board to secure it. Looks pretty good without the tray too! 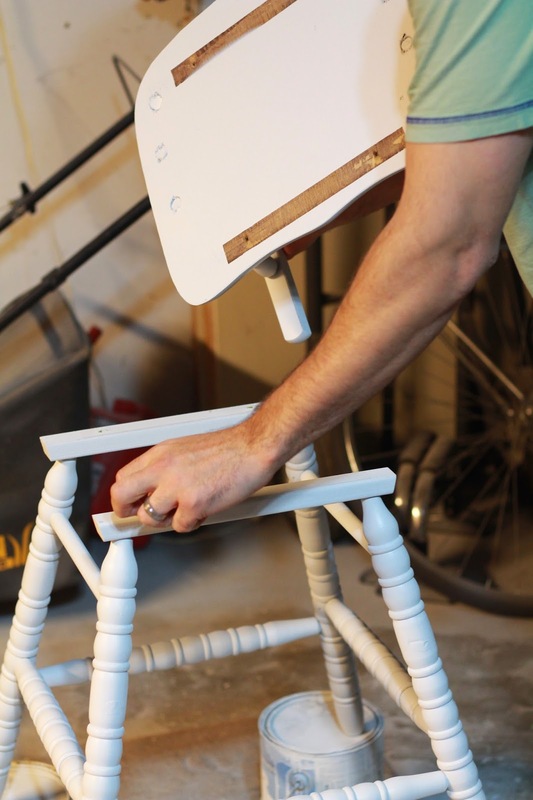 Wood glue and original screws are used to make the chair extra secure. And here she is in all her newfound glory! I just love the way it turned out and I cannot wait for little miss P to have her first smash cake in it in six short months! I absolutely LOVE your cabinets!!! 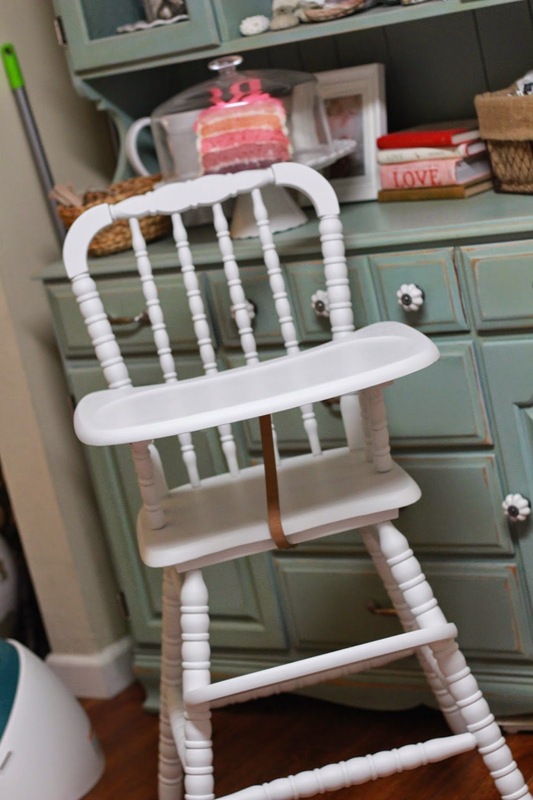 And the highchair looks really great! She is a beauty!! Nice work! 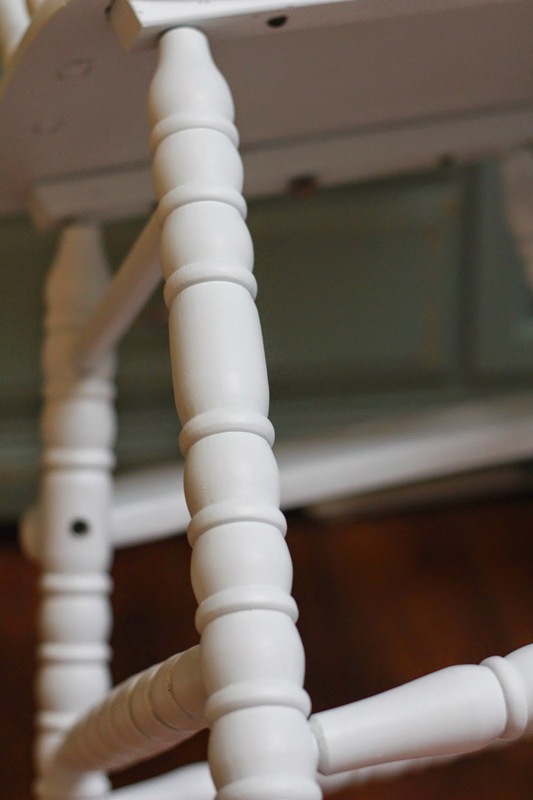 You know I love a good DIY, it turned out just beautiful. And that delicious pink cake in the background looks pretty tempting sitting there! Soo cute and I cannot believe Presley is already 6 months!! Where has the time gone?! You guys did a great job, it looks AWESOME! I'm still so very jealous of this find! I've been on the hunt for one and have yet to find one. Love how it came out! So crafty! Love love love ... great price! It's BEAUTIFUL! Good find and great work on it! What Jen said.. I'm so jealous of your find. That is completely amazing! I started my hunt way late as Avery is turning 1 in a little over two months. 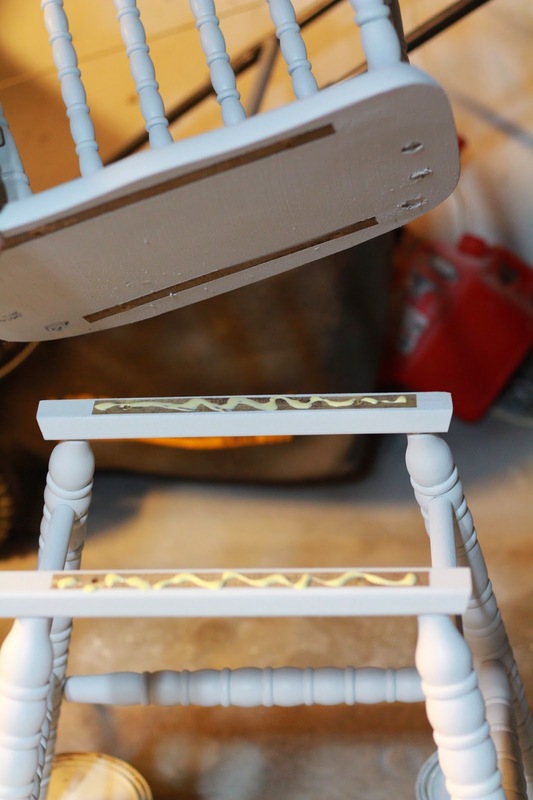 Love how you painted it - it looks perfect!! Wow I love how this came out! Good job hubby! Def trying an air compressor on my next painting project!! What kind of sealant are yall going to use? Do they have any that are low odor like the paint? WOW! That is a STELLAR paint job! I'd love to know which seal/wax you go with after you do it! 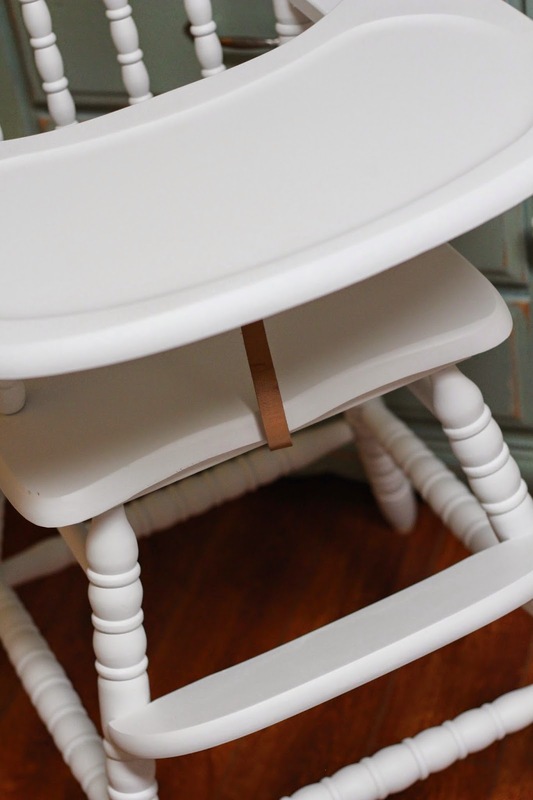 We have the same exact high chair (I hunted FOREVER for it) which I used for Kaitlyn's First Birthday/Cake Smash and never sealed it because I thought it'd be used once or twice. Ended up being used for a few other girls' birthdays and has become our spare highchair for other babies that come over to eat. 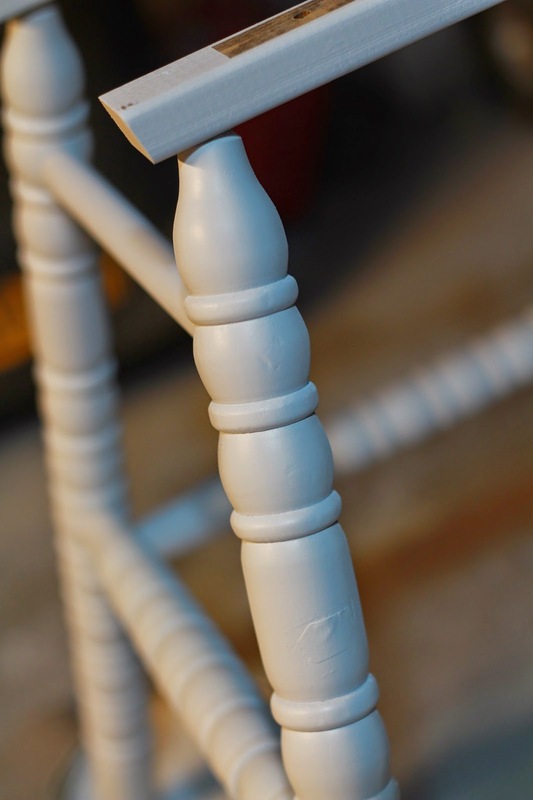 I didn't bother taking it apart and being so meticulous as you did - I just sanded and spray painted it. I love how much care you took doing yours! Thanks for this nice post. Most of the people don't know, that's what types of machine is suitable for his business, because some air compressor reviews is used for heavy duty and some are used for light work. So here our website we will guide you to buy the suitable one in your work purpose in your suitable range.